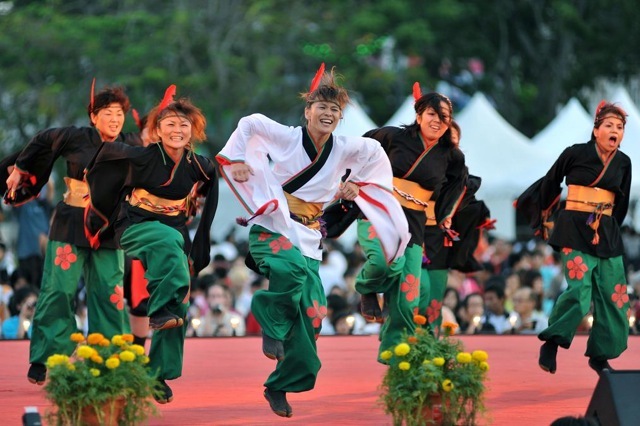 Penang has been a host to a notable Japanese culture for years. 17 to be exact. And this year becomes its 17th year in hosting the Penang Bon Odori Festival in Esplanade, just as it had been the years past. The good news? It starts tonight! It's Bon Odori! Dances! Music! Cosplay! Japan! All here in Penang (except the last one, which is in a land far far away...) (image taken from Penang State Tourism official website). Expect Japanese cuisines, dances and wares abound in this 5 hours long festival, which will see Georgetown, a heritage township known for its narrow roads winding among colonial buildings, getting congested for good reason. Cosplay booths and takoyaki may be the main focus of the crowd, and performance of shamisen (a three string instrument) and traditional Japanese folk dances should not be missed. Bon Odori to the Japanese is what Hungry Ghost Festival is to the Chinese, a festival which is celebrated to honor and remember the dearly departed and ancestors, as well as for their blessings. Differing from the latter is their merry way of celebration, with dances and music. This festival in Penang had drawn crowds from near and far to experience the culture and wares of Japanese origin (or some say actually locally made). This would be especially true for those who could neither afford nor willing to spend their savings on a trip to the land of the rising sun. More about this could be read from New Straits Times and Penang State Tourism Official website. Admission: 6.00 - 11.00 p.m.
A merry way of celebrating a festival which mirrors the Chinese Hungry Ghost Festival (image taken from Penang State Tourism official website).